This image of the floor of Kepler crater in early morning twilight highlights the quality of images from the High Resolution Imaging Science Experiment (HiRISE) camera even under extremely minimal lighting conditions. At the time that this image was acquired, the sun had just barely risen over the horizon. This faint illumination reveals a terrain dotted by numerous exhumed impact craters. These impact craters once dominated the landscape of this region until they were buried under a blanket of soil. Subsequent wind action and perhaps sublimation of subsurface water and carbon-dioxide ice has etched pits and grooves into the blanket of soil, revealing the older impact craters below. These exhumed impact craters can be recognized as circular depressions or plateaus. Also present in this scene are multitudes of dunes that have formed as sand has blown across the terrain. Dunes have accumulated in depressions, such as the pits and grooves associated with the exhumed impact craters, as well as on the floors of some of the larger craters. Image AEB_000002_0100_Red was taken by HiRISE camera onboard NASA's Mars Reconnaissance Orbiter spacecraft on March 25, 2006. The image is centered at 47.14 degrees south latitude, 142.90 degrees east longitude. It is oriented such that north is 7 degrees to the left of up. The range to the target was 1,694 kilometers (1,053 miles). Because the image was acquired by mixing the resolution levels of HiRISE detectors, the scale of the image is 6.76 meters (22.18 feet) per pixel, so objects as small as 27.04 meters (88.71 feet) are resolved. In total this image is 33.88 kilometers (21.05 miles) or 5,017 pixels wide and 37.18 kilometers (23.10 miles) or 5,636 pixels long. The image was taken at a local Mars time of 07:25 and the scene is illuminated from the upper right with a solar incidence angle of 85.1 degrees, thus the sun was about 4.9 degrees above the horizon. At an Ls of 30 degrees (with Ls an indicator of Mars' position in its orbit around the sun), the season on Mars is southern autumn. 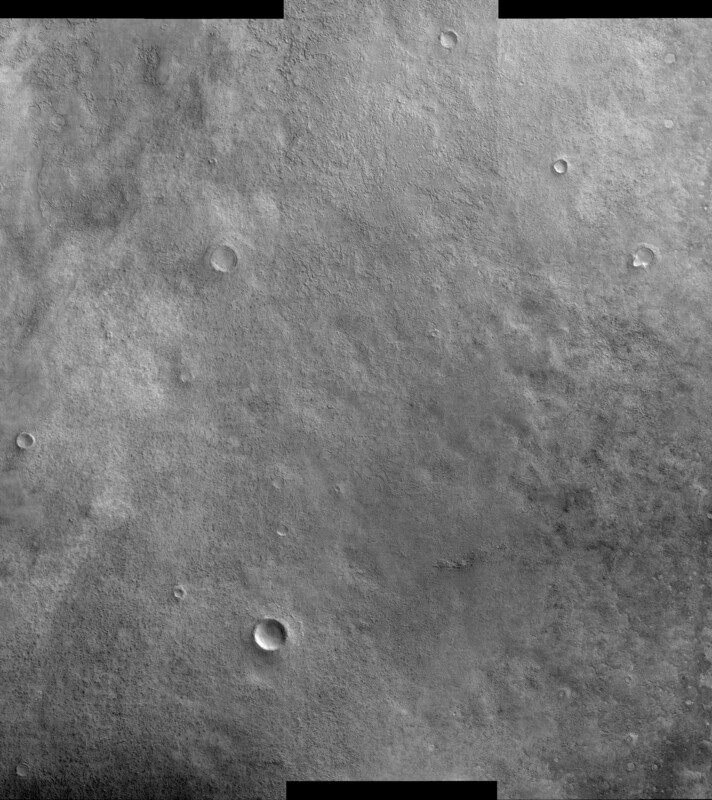 Images from the High Resolution Imaging Science Experiment and additional information about the Mars Reconnaissance Orbiter are available online at: http://www.nasa.gov/mro or http://HiRISE.lpl.arizona.edu. For information about NASA and agency programs on the Web, visit: http://www.nasa.gov. NASA's Jet Propulsion Laboratory, a division of the California Institute of Technology in Pasadena, manages the Mars Reconnaissance Orbiter for NASA's Science Mission Directorate, Washington. Lockheed Martin Space Systems is the prime contractor for the project and built the spacecraft. The HiRISE camera was built by Ball Aerospace and Technology Corporation and is operated by the University of Arizona.